People who listen to Beatle Brunch often ask me who in The Beatles’ circle I’ve interviewed for the show. The answer is pretty much everyone in the inner circle with the exception of John and George, and how I would have loved to speak with either one or both. I did have an almost-John moment and here’s how it went. Back in 1980, when John turned 40, my morning radio partner and I were both committed Beatle fans. Though I was only 22, I loved The Beatles and took any opportunity to pay tribute to them on the air. On October 9th, 1980, when John turned 40, my radio partner Dave Caprita and I sang a duet in tribute to him (with apologies to “From Me to You”) called “From Us to You” using the instrumental side of the released stereo hit with vocals on one side and instruments on the other. The lyrics, a parody of John getting older, sang “When a Beatle reaches 40, he ain’t so young no more, ‘cause his grey hair don’t look sporty, when it reaches to the floor”. Well you can just imagine how corny and funny it might have been to John, who still had his Liverpool sense of humor. We played it on the air a few times and even considered using it on a morning show best-of album we were working on. 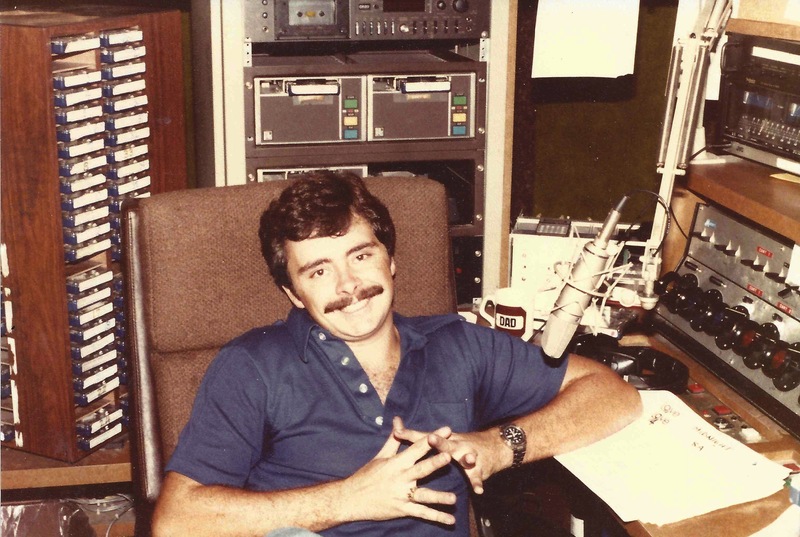 Of course back in 1980, there were no radio stations streaming on line, so the only chance John would have had to hear it is if he were in town staying at his Palm Beach home. Knowing that he probably didn’t hear it, I grabbed a cassette of it and considered popping it in the mail to him, but for some reason I never did. Producing last weekend’s Beatle Brunch tribute to John I was reminded of what a huge Beatle fan he was by one of the artists I spoke with for this show, Dave Morrell. Dave, a super Beatle fan and later, New York record rep in the 70’s, was contacted by John who wanted to see a rare Beatles record from Dave’s collection. 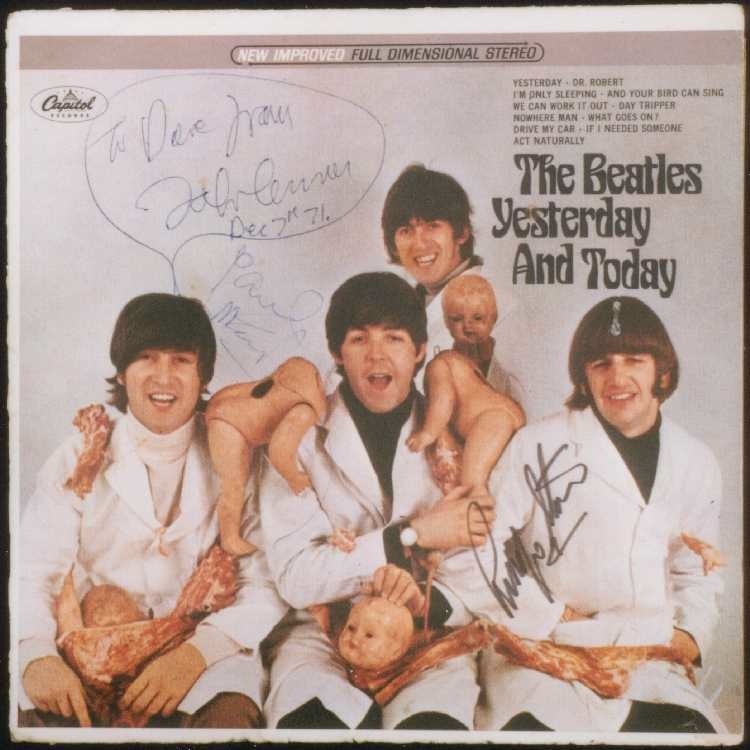 The two met and John was so impressed, that he gave Dave a signed copy of his personal Beatles Butcher Cover album (below). Dave’s book is called “Horsedoggin: The Morrell Archives Vol. 1”, and it’s a fun read about John and Dave’s antics in the crazy world of record promotion. By the way, I never got the chance to meet or speak with John, and sadly, he was killed just two months after I recorded that tribute song for him. But, I’ve just revised this blog because I went back to my tape archives from 34 years ago and found the tribute song on a reel to reel. I’ve uploaded it to the Beatle Brunch website. Just click on the VOX amp in the upper left hand corner of the home page. Remember, this was 34 years ago, before we had multi track and digital recording, so it was sung “live” to the track in a couple of takes (and I was 22 at the time). Hope you enjoy it for what it is. It’s strange to hear it today and think that John was still alive when we recorded it. 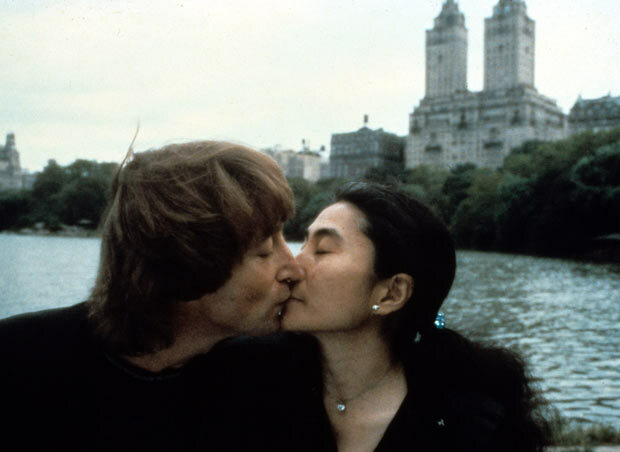 In closing, to add to my opening statement, I have had the chance to meet and interview Yoko Ono on several occasions and I can tell you, she gives a warm, humble and loving interview. Imagine that. Happy Birthday John, your hair would have looked sporty reaching to the floor. 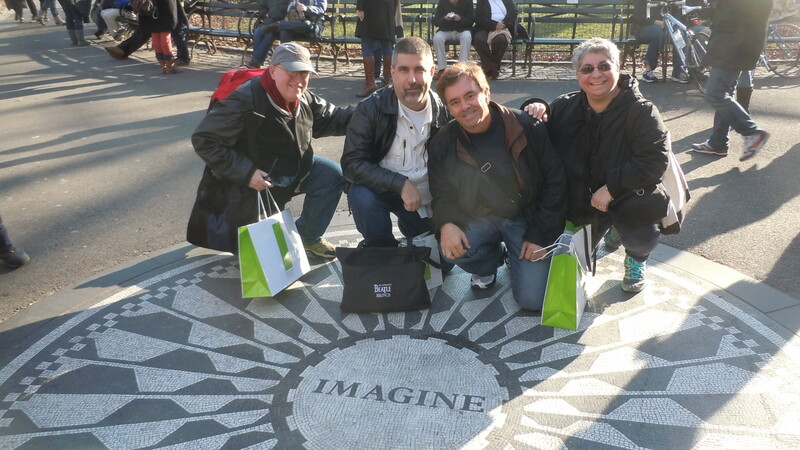 Me and friends at Strawberry Fields, Central Park, l-r Al Sussman, Tom Frangione, yours truly, Susan Ryan. You can find Dave’s book on amazon.com. It’s a fast and fun read. And I hope you had a chance to listen to last weekend’s tribute to John featuring an interview with Dave Morrell and Jude Southerland Kessler, as well as Tim Piper’s musical tribute to John. Join The Beatle Brunch Club to hear the show on demand, with bonus content and click VOX on the home page to hear the song from 1980.